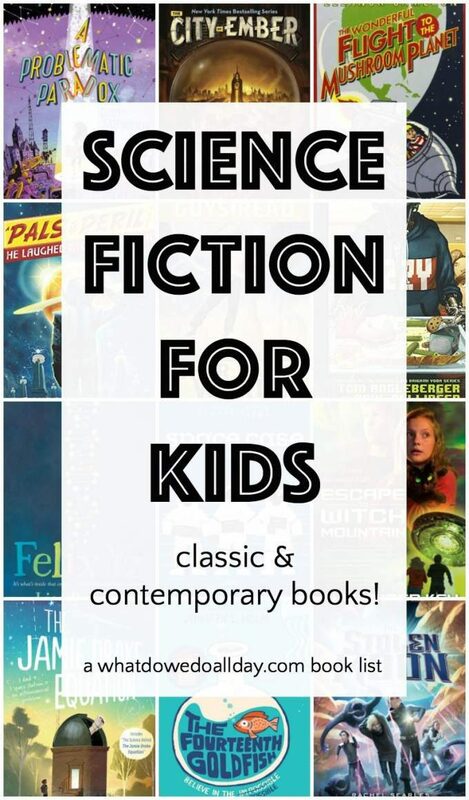 Science fiction books have never really been my thing, but I had a surprisingly good time searching out and reading titles for this list of science fiction books for kids. It’s fair to say I have a new-found appreciation for the genre. A few of these my middle school aged son read in my stead, but I stand by his recommendations! The Fourteenth Goldfish by Jennifer L. Holm. If your kids think middle school is tough, after reading this book they will be glad that at least their grandfather isn’t going to school with them in a teenager’s body! That’s what happens to Ellie when her brilliant scientist grandfather discovers the secret of youth. Lots of fun and science make up this wonderful story told by a well-loved author. And now there is a sequel! A Problematic Paradox by Eliot Sappingfield. Nikola and her father are science geniuses but one day her father is abducted by extremely ugly aliens. Nikola then gets sent to Plaskington International Laboratory School of Scientific Research and Technological Advancement where humans and parahumans study amazingly complex science. Nikola’s adjustment to her new school and classmates is both outlandish and familiar, but throughout the book there is a heavy sprinkling of crazy humor. 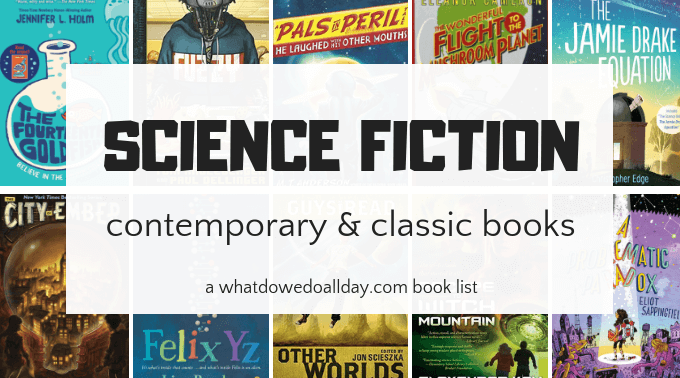 Plus: don’t miss our science fiction picture books list! The Imagination Box (series) by Martyn Ford. Tom makes friend with Professor Eisenstone, who is staying at his parents’ hotel. Professor Eisenstone has invented a machine that can turn your wishes into reality. Through his wishes Tom brings into being a finger monkey, who becomes his wisecracking sidekick, and another, improved Imagination Box! Turns out that was the right thing to do because Professor Eisenstone goes missing and Tom and the Prof’s granddaughter set out to find him and their search leads them to a secret lab under an insane asylum… and that’s when things really start to get weird! I found this read to be suspenseful, intriguing, and funny. Be careful what you wish for! Felix Yz by Lisa Bunker. When he was three, a freak accident left Felix fused with a fourth-dimensional being, Zyx, with whom he communicates with through a keyboard. Now, at ten years old, Felix is preparing for a dangerous experiment in which he and Zyx are to be separated. Felix is keeping a secret blog about the run-up to the separation, detailing his experiences at school, his first crush and family secrets. A unique and touching science fiction book. The Lost Planet (series) by Rachel Searles is set in the future. Chase Garrety wakes up on the planet Trucon with a mysterious head wound and no memory of how he came to be there. Fans of Star Wars might find parallels with that famous universe in the plot lines of the struggle for power between a Federation and a rebellious alliance. This is a high action adventure and the action follows Chase and his friend, Parker, as they travel across planets in a quest to find out who he is. Ambassador (series) by William Alexander. A purple blob arrives to tell Gabriel Fuentes is is to be Earth’s ambassador to the galaxy. Gabe accepts the post but then he finds out Earth — and he — are in trouble. Gabe’s home life gets complicated when his undocumented immigrant parents discover they may be deported. Gabe must balance family difficulties with his galactic troubles. Very suspenseful! And your kids will be eager to read the second book, Nomad, to learn how it all gets resolved. Fuzzy by Tom Angleberger and Paul Dellinger is a funny science fiction book for kids. Seventh grader Max(ine) loves robots and is super excited that her school is about to get the first robot student as part of the Robot Integration Program. Teachers and principal are already robots and Max needs to figure out why her grades are mysteriously declining, despite her diligent studying. Together, with Fuzzy the robot student, she discovers an evil evaluation system run by none other than the principal! Space Case (series) by Stuart Gibbs. My older son loves this series! Dashiell Gibson is one of the first humans to live on the moon but he is super bored because he is not allowed to go anywhere. When one of the top scientists is found dead, Dash suspects it is something more than just a helmet mishap. A thrilling mystery set in a unique location. Guys Read: Other Worlds ed. by Jon Scieszkais. My only quibble with the Guys Read series is the “Guys” label. I get the idea, but of course gals will really enjoy these exciting stories, too. A stellar line up of authors, including Shannon Hale, Tom Angleberger and Rebecca Stead are included in this collection of science fiction short stories. It even includes a new Percy Jackson tale. The Jamie Drake Equation by Christopher Edge. Jamie is super proud of his astronaut dad who is currently orbiting the earth. While is dad is gone, Jamie meets an astronomer who has hacked into the Hubble telescope. After the encounter, aliens start to communicate with Jamie through his cellphone. Jamie’s discovery, his dad’s mission and family conflict collide and Jamie must figure out what to do about it all. Time Traveling with a Hamster by Ross Welford. In this, one of the few children’s books with a British Indian protagonist, Al Chaudhury gets a letter and a hamster from his deceased father. The letter tells him to find his father’s time travel machine and go back in time to avert a disaster. A fun and suspenseful read. The Shadow Cipher by Laura Ruby. In this elaborate story, three friends band together in New York City to solve a cipher that connects their apartment building to a centuries-old mystery of how the city was conceived. This is a hefty, compelling book with stellar writing, and complex, well-rounded characters. The City of Ember (series) by Jeanne DuPrau is a great science fiction book for middle school. My son came home one day saying, “Mom, you have to read this. This book is SO GOOD.” Ember, an underground city, is running out of food and supplies. Lina and Doon discover a parchment that may hold the key to saving the city and they set out on a perilous journey. A Wrinkle in Time (Time Quintet) by Madeleine L’Engle. This classic series hardly needs an introduction. If your kids have read Percy Jackson and the other Riordan series, and they haven’t yet read L’Engle’s books, give them a copy of this timeless book. Mrs. Frisby and the Rats of NIMH by Robert C. O’Brien is a classic for every kid! This story centers around Mrs. Frisby who must move her family in order to survive and in doing so encounters a group of mice bred for intelligence. Winner of the 1972 Newbery Medal. The Wonderful Flight to Mushroom Planet by Eleanor Cameron. This 1954 science fiction classic book for kids is great fun. Prompted by a newspaper advertisement, two friends put together a homemade spaceship. When they take their creation to Mr. Tyco Bass, he turns it into a space-worthy vehicle and sends the boys on a mission to the planet, Basidium, where the boys help the inhabitants who are declining due to a mysterious illness. Escape to Witch Mountain by Alexander Key. Many of us Gen Xers will remember the movie, but did you know it was a book? Twins, Tony and Tia, have paranormal powers. After the death of their grandmother they are sent to an depressing orphanage. After they run away, the twins discover they are actually extraterrestrials and attempt to reunite with their own kind. The Little Prince by Antoine de Saint-Exupéry. I remember reading this book for the first time when I was in 3rd grade, which may be a little young. I think tweens are at a good age to start thinking about the wider philosophical ideas presented in this classic book about a prince who finds himself on a strange new planet. The Giver (Giver Quartet) by Lois Lowry. 12 year old Jonas lives in “The Community” in which sameness is valued and everyone’s life is pre-determined by the elders. Jonas learns the truth, however, when he is designated as the next “Receiver of Memory”, the only person who is allowed to learn about the past and the outside world. There are some heavy issues in the book, but the message is clear: freedom for people to learn and follow their own path, despite pain and chaos, are more valuable than ignorance and safety. That’s a lesson I want to teach my kids. The Mysterious Island by Jules Verne is one of his may classic science fiction books for middle school readers. I had a difficult time choosing which Verne book to include. All are very exciting, suspenseful adventures. I chose The Mysterious Island mainly because it is lesser known than Twenty Thousand Leagues Under the Sea (it’s also a sequel of sorts to this novel) and Around the World in Eighty Days. A gang of characters escape from a Civil War prison via hot air balloon and find themselves stranded on an island where strange things happen. Science fiction fans will love it. Note that the movie of 20,000 Leagues Under the Sea contains scenes from The Mysterious Island. I would add a new one I just read. The Wild Robot by Peter Brown who also wrote Creepy Carrots.